Does this sound like your day: You wake up, you sit on the side of the bed. You get in your car, bus or train and sit. You get to work and sit. Get home and sit down for dinner and to watch TV. You get up only to go and lay down in bed.. repeat! Standing desks are a great and healthy way to work. 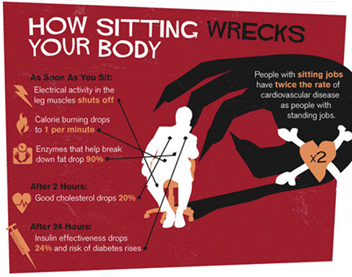 Several reliable sources state how unhealthy it is to remain seated at a desk or computer all day. It doesn’t matter if you work out for three hours every day of the week or jog three miles every morning, if you remain seated for the majority of the day, you run an increased risk of diabetes, heart disease, obesity, a variety of cancers, and, ultimately an early death. A standing desk is pretty much what you think it would be. A desk for working or writing while standing. No matter how active or inactive a person may be, a standing desk is ideal for any lifestyle or job that requires or otherwise promotes that one remain seated the majority of the day. In this article we look at the Standing Desk pros and cons. There are many different benefits to a standing desk. Standing regularly is shown to improve metabolism greatly over sitting and burns roughly an extra 50 calories an hour more than sitting. So can aid weight loss, many customer reviews report losing up to five pounds in the first week. It’s not much weight but it is a large improvement over the weight that could be gained from sitting for that amount of time. Another benefit to a standing desk is improved attention span. Many customers indicate that working at a standing desk makes them feel more attuned to their work, as if the aspect of standing makes them focus and concentrate more, reminding them that they are supposed to be working. This benefits individuals who have trouble paying attention, who claim that they get much more work done quickly while standing at their desk rather than sitting. Back pain is also reduced in people who have switched to a standing desk. Many back problems people suffer from originate from extensive amounts of time sitting and slouching in chairs and at desks. The standing desk eliminates these problems and helps prevent similar problems from occurring in those who need to spend many hours a day seated for work or recreation. It seems that every benefit also comes with its own set of detriments as well. There are a few negative aspect in customer reviews on the standing desk. One of those disadvantages many people come across is sore feet. Especially in the first couple of weeks as the body and feet adjusts to a routine of standing for hours rather than sitting. Many customers also complain about the fact that they have needed to wear shoes with insoles while working at the standing desk. This helps relieve the foot pain that they experience but it also causes side effects such as increased foot sweat and not being able to wear those cosy house slippers they have grown accustomed to as often. One way to combat this would be to get a Standing Desk Mat. A standing desk does not work so well with laptops either. The space between screen and keyboard can be significantly smaller than the distance between eye and elbow. There have also been reports of an increased chance to get varicose veins, but as long as you don’t stand for too long, or stand perfectly still, the risk is low. Your body will naturally want to move while on a standing desk, let it. The other option is to purchase a Treadmill Desk, that’s the next level.. There are a great deal of benefits that can come with having a standing desk, but every good thing in life comes with a price. Despite the small list of issues people seem to have with the standing desk, it seems in the end there is more ‘good’ to be come out of standing than ‘bad’. It is most certainly much better than all of the various detriments that come with sitting all day every day. Obviously if you have an adjustable desk then you can sit to rest those feet initially.